Malala Yousafzai, at age sixteen, has captured the world’s attention. In an interview with The Daily Show’s Jon Stewart earlier this week, the Pakistani schoolgirl recalled wondering about the possibility of being killed by the Taliban. It’s hardly rhetoric. The Taliban did indeed come to kill her. She has continued to fight back with her greatest weapons — her mind and her voice. Malala’s definition of fighting back is to educate the world, hence the launch of The Malala Fund, which aims to build schools and get some of the 57 million children not currently in school the education they desperately need. 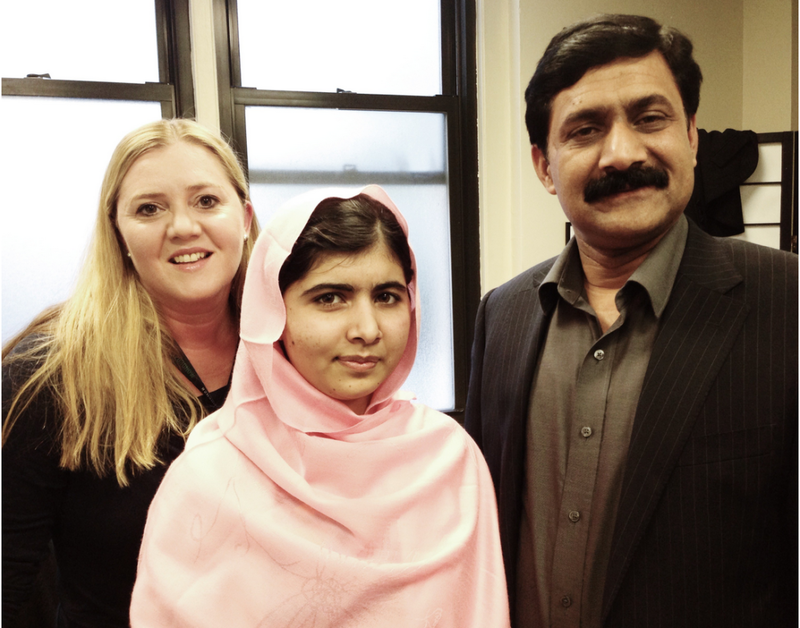 I had the great honor of spending a few minutes with Malala and her father Ziauddin Yousafzai at last month’s Social Good Summit during UN Week. In a small ‘green room’ back stage at the 92nd Street Y, we spoke about her work, her family and her faith. Malala was poised, calm and thoughtful. There are two things that struck me about this wonderful opportunity. 1. We must never underestimate the power of a girl. On this day of recognition for girls around the world, International Day of the Girl, it is more imperative than ever that we see girls for the solutions they are. When they are educated, they change entire nations. But with 1 in 7 girls in the world’s poorest countries married before they are 15 and complications from pregnancy and childbirth as the leading cause of death for girls between 15-19, we have significant problems to overcome. We simply must unlock that potential on a global scale. For every extra year of elementary school education a girl receives (above the mean) her eventual wages increase 10-20% and every extra year of secondary school translates to a 15-25% increase in average income according to the World Bank. But it’s much more than that. A literate mother’s children are more likely to survive past the age of five. A girl with basic education is three times less likely to contract HIV AIDS. Study after study demonstrates how educated girls contribute back to their families – both the ones they come from, and the ones they will create in the future. 2. We need more fathers and male champions to speak out for girls. Malala’s drive and commitment is undeniable. And without taking one moment away from her incredible achievements, in the conservative environment of the Swat Valley were she was raised and where she was shot, none of it would be possible without the permission and example of her father. There are hundreds of thousands of communities just like the Swat Valley around the world, including right here at home. And we need to encourage and make it acceptable for those fathers and other male voices to step up for all daughters. Sign the Girl Declaration, a document crafted by girls for girls to ensure they become part of the world’s agenda. Join Girl Up for #11DaysofAction www.11daysofaction.org and make your actions count for International Day of the Girl. Support Malala’s work with the Malala Fund.